I was invited to attend the VaVaVoom TV Fashion Roadshow which visited Galway last night on it’s current tour of Ireland. I was excited to attend this couture and ready-to-wear fashion show especially as there was so many Irish designers/milliners being showcased at the event. So I finally braved the stockings trend! For A/W stockings make a funky alternative to tights/leggings and can be dressed up or down to suit your look. I picked up this sparkly dress in Penneys/Primark recently for only €15, I loved it’s flattering skater style and the length of the sleeves make for a cute look.I added some pops of leopard print with the Kelly Brook for New Look shoes (From A/W ’12) and a shoulder handbag which I picked up at a flea market in Galway (Pandoras Box). The venue for the fashion roadshow couldn’t have been better. It was a very intimate setting and I loved the chandelier decor and extravagant chairs at the end of the catwalk. 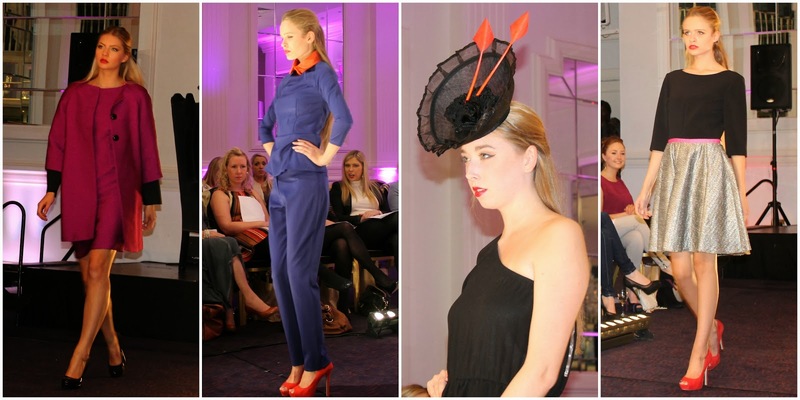 I was delighted to see some of my favourite Galway based milliners Mary White Millinery and Fiona Mangan Millinery being showcased in the event. I also loved being introduced to some new Irish designers. Some of my favourite looks are shared below. My favourite look of the night was definitely the blue shirt/pant combo from Lennon Courtney shown below. I would love to wear this outfit to the office! So stylish!